Huntington disease (HD) came into Lauren Holder’s life was she was 15 years old. Lauren’s grandfather Rose had been estranged from much of his family because he’d been aggressive and because they thought he’d had a drinking problem. Lauren’s parents were the only ones who kept in touch and tried to help him by bringing him to live with them in North Carolina. He wasn’t cleaning; he wasn’t taking care of his dog; and he wasn’t taking care of himself. When he got the diagnosis of HD, everything clicked. His aggressiveness. His wobbliness. His inability to care for himself. It was HD all along. At first, Rose panicked and tried to run away. He got as far as Tennessee when his car broke down. Lauren’s family brought him home. He tried again and made it all the way to Seattle. “When he got there, his car was taken away. Dad had to fly out to get the car and drive it home,” Lauren said. Her grandfather stayed in Seattle. For the next four years, Lauren thought about her grandfather and about her potential for having the HD gene. She couldn’t get the predictive test without having someone in the family diagnosed with HD, but her grandfather was missing and her father, Steve, wasn’t interested in testing. Persistence being one of Lauren’s many strengths, she eventually tracked down her grandfather in a nursing home in Seattle, bedridden. Lauren got her test, which was positive, and continued to call out to the nursing home to check on her grandfather. She always got a generic update, that nothing had changed and Rose was fine, until one time, a nurse told her plainly that her grandfather was in terrible shape. She made emergency trip out to see her grandfather, fearing it would be her last chance to see him. Lauren’s trip to see her grandfather prompted other family members to travel to see him too. They all said goodbye and he died a few months later. Steve hadn’t been tested by the time Lauren got her test, but he was already showing behavioral symptoms. She didn’t share her results with him until he asked. It took three months. She wanted to protect him because he would have to have the gene for her to have inherited it. Unfortunately, Lauren’s father was already an insulin-dependent diabetic by the time he was diagnosed with HD, and due to issues with obtaining Medicare, he went without care for two years. His kidneys failed. 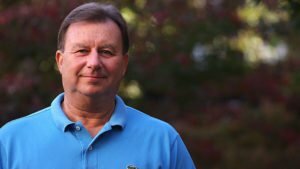 When his insurance finally kicked in, he started dialysis, and eventually, he got a transplant. “Anybody would have a hard time with a kidney transplant and it’s been multiplied many times over for him,” Lauren said. Lauren said that medications transplants require can be neurotoxic, and for father, whose brain was already suffering damage from HD, recovery was particularly difficult. In addition to the physical toll the transplant took on his body, his HD symptoms were worse. His cognition declined and he couldn’t walk anymore. It took a year for Steve to return to his normal self. “It’s amazing, and I feel like I have a second chance,” Lauren said. She also puts her seemingly limitless energy toward advocacy and education. 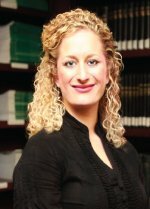 She’s an active participant in HDSA, both in North Carolina and nationally. Lauren shares her story openly and talks about how depression and anxiety can drag her down at times and how she pulls herself out of it. In addition to helping care for her family and doing advocacy, Lauren is making a difference for HD by participating in all the research she can. She’s participated in ENROLL, COHORT, PREDICT, and a few others. She’s currently participating in a clinical trial, and finds being able to do so is gratifying. “It’s important to be involved in research, otherwise, we’re not going to find that treatment or that cure,” Lauren said. 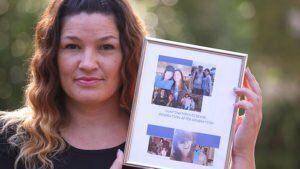 No one talked about Huntington disease (HD) in Katrina Hamel’s house when she was growing up. No one told her that her grandmother took her own life because of it or that there was a biological reason for her mother’s anger. 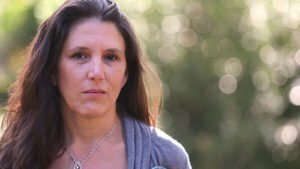 Katrina didn’t hear about HD until she and her brothers moved out and her mother, Allyson, moved from California to Connecticut with an abusive boyfriend. Katrina’s father told her that Allyson knew she had the genetic disease in her family, and she was sure she had it. Katrina couldn’t ask her about it because once Allyson got to Connecticut, she disappeared. Years later, in 2003, Katrina heard her mother was back in California, pregnant and homeless. Although she was still angry at her mother, she wanted to help, so Katrina who was also pregnant, took in Allyson. Katrina had done some research on HD, but she didn’t find much. Her mother’s behavior was startling. “It was a really crazy six months,” Katrina said. Katrina was working, running a household, parenting her daughter, and caring for her pregnant and ill mother. Katrina delivered her son, and two weeks later, her mother gave birth. Allyson’s boyfriend came back and took her and Katrina’s half-brother back to Connecticut. Allyson was supposed to get in touch once they got back there, but like last time, her mother disappeared. Katrina decided to get tested, and she found she doesn’t carry the gene. Six years later, Katrina, who had been searching for her mother for three years, found Allyson in a homeless shelter in Connecticut. However, the shelter couldn’t provide the level of care she needed. Allyson couldn’t shower or keep herself clean and the shelter didn’t have a medical bed. Katrina found out that her half-brother had gone into foster care and was eventually adopted. After several days of working with the shelter, Katrina connected with a retired airline worker there who volunteered to fly with Allyson back to California. When Katrina last saw her mother, Allyson was functional and she didn’t have noticeable chorea. Most of her HD symptoms were behavioral and psychiatric. The formerly athletic woman was in a wheelchair when she came off the plane. Katrina took Allyson home and set her up in her older daughter’s room. She cut off the helmet of hair matted to her head, and to Katrina, her mother seemed happy to be back with her family. It took a couple weeks for the family to see the toll HD had taken on Allyson’s personality and her ability to withstand visits, noise, and spontaneous outings that come with living with a young family. She would get overstimulated and angry. They learned to keep things quiet and predictable. Allyson was able to use a walker to get around in the house, and although she could feed herself, there was a lot of spilling. Her smoking habit got dangerous, setting her hair on fire several times. They moved to a larger house and gave Allyson a sunroom, which had a door that allowed her to go outside to smoke. Katrina lined the bottom half of the walls with plastic so they could easily clean up after meals. They covered her mattress to protect it from urine and set her up with a bedside commode. Although Katrina worked in homecare, many of the safety issues HD presented were new to her. She waded through them, using trial and error to provide what Allyson needed. Even still, it was hard to avoid injuries, and Allyson refused to see a doctor. Katrina recalled that her mother once fell and hit the table, which was well padded, but it still cut her ear lobe badly. She wouldn’t go to a doctor and wouldn’t let Katrina call 911. Even if Katrina did, Allyson could refuse care. “I was literally left with super gluing her ear back together,” Katrina said. Allyson got weaker and weaker. The happiest times for her was when her social security check would arrive and Katrina would take her to spend it. Allyson would get snacks and Jack in the Box and eat and eat and eat. But after an altercation while out, the police called in the mental health care team and took her to the hospital. Finally, Katrina had help. It wasn’t ideal, but it was help. While staying in a nursing home three hours away, peppered with visits from Katrina and her family, Allyson dwindled away to just 80 lbs. Katrina, who was now running a hospice care home, knew her mother needed hospice. The hospice house allowed Katrina to sleep there and care for her mother. Allyson died, just 11 days later, with her daughter, two sons, son-in-law and grandchildren by her side. “She struggled, the entire disease, she struggled,” Katrina said. After Allyson died, Katrina’s older brother Kevin decided he needed to get tested. 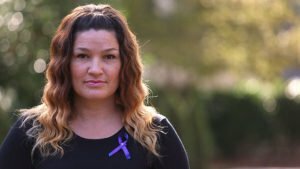 Katrina had been juggling so much with her mother’s care, her young family, and her career, she hadn’t seen her brother was already struggling. He was having a hard time keeping a job, his relationships kept blowing up, and he was easily frustrated over the simplest things. When her brother’s test came back positive, Katrina bawled, but she was grateful that Kevin hadn’t seen the day-to-day struggle their mother had. And his course will be better. Because of Katrina. Katrina knows home care, hospice, and through caring for her mother, she knows HD very well. And she’s not stopping there. While Allyson was still alive, one of the few places she was able to find support was with Help 4 HD. Since her mother’s death, Katrina has gotten progressively more involved in the organization and is currently the Vice President. In addition, Katrina and her brother have both participated in research as a way to give back to the HD community. Katie and Mike were friends for years and then in college, something clicked. They fell in love. They had a daughter, and few years later, a son. Mike found his calling and became a Sheriff’s deputy. Life fell into place. Then Mike’s uncle called. Mike hadn’t been in touch with his father or that side of his family since he was very young and had moved to near Sacramento, CA. His uncle told him his father was dying from Huntington disease (HD). “We didn’t know anything about HD, so I guess ignorance is bliss,” Katie said. After Mike’s father died, he decided to get tested for the gene. Katie got the results that Mike was positive while he was at an officer’s funeral and wanted to wait to tell him until they were home. When she went to pick him up, he told her he was feeling positive about the results. He was sure he didn’t have it. Katie had to pull over and tell him because she couldn’t hold back the tears until they got home. For a little while, life fell apart. Mike started behaving recklessly. It wasn’t long after Mike’s positive test that he started showing symptoms. It started with a finger that wouldn’t stop tapping. Katie didn’t recognize it as chorea at first because what she’d read about chorea was much more significant movements. Realizing they needed more expert help than their primary care physician could provide, Katie and Mike started seeing Dr. Vicki Wheelock and the rest of the HD team at the University of California – Davis. There, they met Terry Tempkin, who was the clinical project manager. She was helping Mike to enroll in clinical trials, but his behavior was making it difficult. She told him he couldn’t do clinical trials and behave recklessly. “I always tell Terry that she saved my marriage,” Katie said. Mike’s behavior stopped, but his movements got worse. Thankfully, tetrabenazine had just been approved. It took three months to get the medication, but Mike was among the first to get it more than a decade ago. Immediately, Katie turned to advocacy. Growing up with a brother with cystic fibrosis and a mother who worked tirelessly to make sure he got what he needed, Katie knew exactly how to fight for her husband and HD. 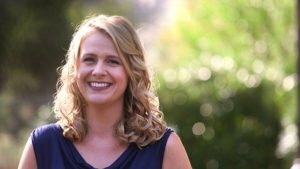 Katie threw herself into advocacy, finding her way to Help 4 HD International. After years of exponential growth for the organization, she is now its president. Help 4 HD has taken on law enforcement education, ensuring officers understand HD and how its symptoms can put people with HD in precarious situations with law enforcement and how they can diffuse situations. Help 4 HD also fundraises for Juvenile HD, which is incredibly rare and gets little funding from private companies and the federal government. It is a communications partner with Huntington Study Group, helping HSG get the word out about its clinical trial opportunities. Katie hosts Help 4 HD’s weekly blog radio broadcast on topics ranging from long-term care and homelessness to basic science. For her own family, Katie advocates participating in research. 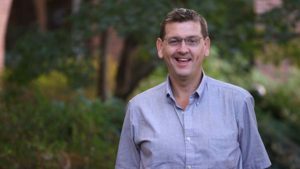 Mike has been in many observational and clinical trials, including ENROLL, Pre-CELL, CoQ10 and COHORT. And her kids have participated in HD Kids in Iowa. Katie said families are important for research and points to the polio epidemic. 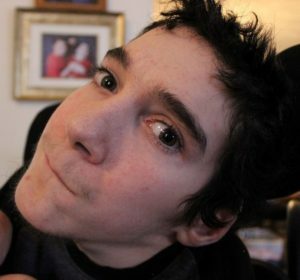 By the time Chris O’Brien was born, his mother was already showing signs of Huntington disease (HD). He was the seventh and last of Alice and Dr. David O’Brien’s children, and like many of his siblings, he was born with a zeal for life. In his junior year at Yale University, Chris and his father attended a medical meeting on HD, and it was there that he met Nancy Wexler. Dr. Wexler was working with a team of researchers trying to isolate the HD gene in a large family in Venezuela. Chris worked for her for a few summers at Columbia University, and he went with her team to Venezuela several times. On his last trip to Venezuela, there was a coup d’etat and everyone but Nancy left for safety reasons. Chris stayed to help and protect Nancy. “I never really get scared,” Chris said. Meeting and working with Nancy opened up a whole other world of research to Chris. After the gene was isolated, Chris was tested and found out he had the HD gene. Eventually, the family learned that four of the O’Brien children had the gene. Knowing his fate didn’t change Chris’s plans. He was determined to complete his education and training, and along the way, he would also travel the world and climb mountains. That zeal for life also inspired Mike and Chris to hatch a daring plan to raise money for the Hereditary Disease Foundation, which Nancy Wexler’s father founded to help find a cure for HD. They decided to raise $100,000 by climbing Mt. Everest and becoming the first pair of American brothers to do so together. It was the last year of medical school for Chris, but he was determined to both graduate and meet his fundraising and climbing goal. By the time the brothers made it to the mountain in the spring of 2005, they were still $85,000 short of their fundraising goal, but they were undeterred. Once they summited, they figured the money would come along with the publicity. Unfortunately, while climbing through the Khumbu Icefall, Mike fell into a crevasse. Chris rappelled down to try to save his brother, who was conscious for about 45 minutes but then stopped breathing. Chris and another climber performed CPR on him for two hours until a rescue team arrived from base camp, but Mike was already gone. The New York Times, and newspapers and newscasts all over the world covered the tragedy, raising awareness of their cause and topping their fundraising goal. In the end, Chris and Mike raised $350,000 for the Hereditary Disease Foundation from people all over the world. Chris graduated from medical school and finished his PhD. He moved to Texas for his residency, but by his third year, in 2008-09, he couldn’t keep up anymore. The symptoms of HD had caught up to him. “I didn’t think it would happen that early. I thought I would practice for a little while,” Chris said. But ever the optimist, Chris said that he wouldn’t have met his wife, Lili, if he hadn’t gone to Texas. Chris continues to raise awareness of HD and attended the Huntington Study Group’s annual meeting in 2016, as a neuroscientist. He participates in HD research, having taken part in a trial for tetrabenazine and another for coenzyme Q, and he plans to stay involved. I came into this world a loving boy. Ran and laughed and played with all my toys. When my body and mind wouldn’t let me play. Just to eat, think and turn my head to look at you. The one thing I want, but can not say, I love you each and every day. That one day we will find a cure. Take this away, we won’t quit the fight of the dreaded disease that had taken so much of me. I am no longer in control, can you hear my pleas? We never give up the fight. And all the names of all the angels will do some good. The dreadful strand know as J.H.D. -Written by Terry “Santini” Sargent Jr.
Theresa’s mother was in a car accident near her home outside Atlanta and doctors thought she might have had a brain injury as a result. Eventually, doctors figured out that she had Huntington disease (HD). The adults in the family had a family meeting and decided they wouldn’t tell anyone outside the family. They turned to prayer for strength. At the time, Theresa and her siblings didn’t have any desire to be tested. 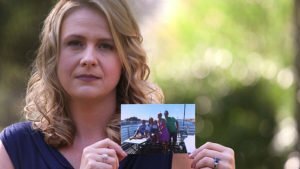 They’d all already had their children and, without a disease modifying treatment, they didn’t see the point in finding out whether they carried the HD gene. Rusty and Theresa’s daughters knew their grandmother was sick and had HD, but they didn’t talk about it. “We kind of lived with that for a while,” Rusty said. When Rusty and Theresa’s daughter Lacey was about 20, her two sisters started noticing movement issues in her. The family launched into gear. They went through genetic counseling and Theresa had the test done. It came back positive with 40 CAG repeats. Lacey got the test after her mother. Her test also came back positive, but her CAG repeat was 44. By her mid-20s, Lacey progressed to the point that she couldn’t feed herself, stand or walk. But her smile is quick and her family is behind her. “We have a lot of faith in our God and we both have family and friends and friends that are family that are praying for us, supporting us along the way,” Rusty said. They family is also pursuing all treatment options available for both Lacey and Theresa and trust their care teams at Emory and Vanderbilt. In addition to a combination of medications to help with movement, Lacey also has a physical, occupational, and speech therapist to help her make the best of the abilities she has. Theresa’s symptoms are very mild and she works in accounts receivable at a local hardware chain, where her coworkers and the owners are very supportive of the family. Rusty said he is blessed to be able to work from home. A caretaker is in the house during work hours to care for Lacey, but Rusty is nearby to assist, if need be. 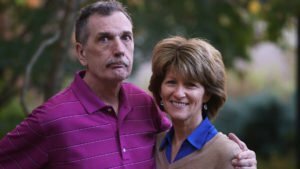 Early on in their relationship, Ann and David Nelson decided they would prepare as if Dave had the Huntington disease (HD) gene, but they would live as if he didn’t. They travelled a lot. Greece, Italy, white water rafting in the Grand Canyon, camping, biking, scuba diving. “Our friends used to say, don’t go on vacation with Ann and Dave because you’ll never get rest,” Ann joked. And they planned. David changed his focus after medical school from neurosurgery to neuroradiology, lessening risk to patients, should he develop the disease. After a decade of marriage, they adopted a daughter, Claire, from China, instead of having biological children. Just in case. Three years later, they adopted Audrey. It was about then that Ann started seeing signs of HD in her loving husband. She saw twitches in his fingers she never noticed before. At a family reunion, he stayed back in their condo the whole time. He didn’t want to be around the bustle and noise of the family. And he became irritable, a big change from his usually exceedingly agreeable personality. Dave started complaining that his coworkers were out to get him. At first Ann was angry with them. Why would they be so awful to the hard-working 20-year veteran? It got tougher for Dave to concentrate at work and his productivity declined. He had several negative interactions with his coworkers. In April 2007, he was given a choice: Resign or quit. Dave resigned and tried other, slower-paced jobs, but he just couldn’t keep up. Halfway through 2008, Dave stopped working all together. The next five years of transition were difficult for the family. They had to adjust to having no income and with each new symptom or symptom progression, it forced the family through the cycles of grief again. Dave, like many people with HD, spent money he didn’t have. Once he bought a sports car, putting $20,000 on a credit card. He couldn’t even drive it home. Audrey was very young when her father’s symptoms began. She doesn’t remember him without HD, which breaks Ann’s heart. But Dave doesn’t remember what he’s lost. 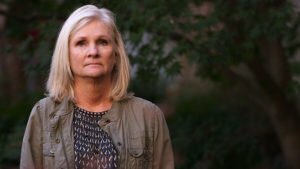 “That is part of God’s grace in this disease, and you have to embrace that and just move on,” Ann said. The family has adjusted to their new reality. Routine is important, and after a terrifying incident at a New York City airport several years ago, Dave is judicious about taking his medication and seems content. Ann doesn’t dwell on what Dave has lost either. Dave isn’t in any pain, and for that she is grateful. When they were younger and so busy, Ann felt she didn’t slow down and enjoy the simple pleasures of life. She’s thankful she has the time with her husband to do that now, and she sets aside time to do that for herself too. She’s very active in her church, tapping into her faith for strength, and spending time with friends giving and getting support. And she’s teaching those life principles to their daughters. Patience, love, empathy, always being there for your loved one. For HD Awareness Month, the Huntington Study Group is launching an education campaign, aimed at helping health care providers who are less experienced with Huntington disease (HD) to learn more about how to care for their patients and families with HD. HSG wants to share insights of our experienced HSG members with less experienced providers to help them better understand issues faced by HD patients and families. So, HSG is launching a new education section of our website with tools to help new HD providers. Please share this new section of our website with the providers who call you for help and let us know if you have more ideas for resources we can add. If you are on social media, we encourage you to share all of this information with your networks to ensure the word gets out there. If you’re a hashtag user, we’ll be using both #hdisatreatabledisease and #letstalkabouthd (HDSA’s hashtag) throughout May, HD Awareness Month. Participating in Huntington’s disease research is important to Katie Moser. Katie, 34, is gene positive and showing no symptoms of HD. She has a full-time job, friends, and a house, but she still chooses to take the time to participate in the trials and studies she can. She’s even driven five hours from her home in Elizabethtown, PA, to Rochester, NY, to participate. Katie’s maternal grandfather died from complications of HD. She is an occupational therapist who chose to work with patients in an inpatient Huntington’s disease unit, where she saw the impact of the disease. Still, she chose to find out whether she carried the mutation, although most at-risk young people don’t. She raises money for research and participates in trials, helping to find treatments and, someday, a cure. 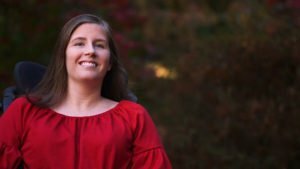 Katie’s advocacy and outgoing personality caught the attention of Lundbeck, a pharmaceutical company that specializes in finding therapies for central nervous system disorders. 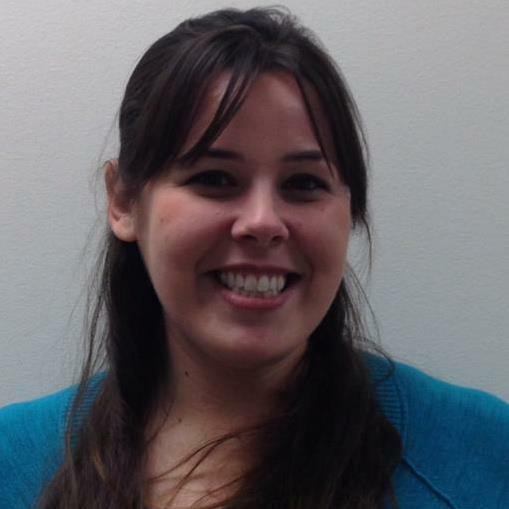 Katie is now a manager of Advocacy and Patient Support in Lundbeck’s Movement Disorder Marketing department. She travels the country, connecting with HD families at conferences, walks and other events. Her background in OT and her family experience helps her connect in a way no one else can. 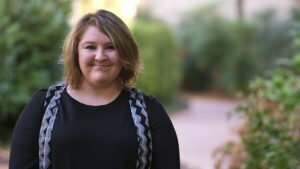 Katie knows each individual’s situation is unique and doesn’t pressure anyone into participating, especially when trials need gene-positive participants. Not everyone wants to know their status. “I tell people where to find information on trials. I direct people to the sites like HD Buzz to get information about research that will be easier for them to understand. And then I share my experience participating in trials,” Katie said. Katie has participated in at least four multi-center trials and studies, as well as several smaller studies that only required one visit. She has traveled to New York City, Connecticut and Rochester to participate. She’s currently in ENROLL-HD, which is an observational study and one that doesn’t require participants to know their gene status. “It’s a little exhausting,” Katie admitted. But even when one of the trials she participated in didn’t produce positive results (coenzyme Q10), at least it told researchers something. To find out about HSG trials as soon as they launch, sign up for our future contact database. The Huntington’s Disease Society of America’s HD Trial Finder is a great resource for finding all currently enrolling HD trials, as well as clinicaltrials.gov. To learn more about Katie’s experience learning her gene status, read the 2007 New York Times feature article, “The DNA Age: Facing Life with a Lethal Gene,” by Amy Harmon. Being a member of such a focused, bright, and motivated group, is very inspiring and energizes me as we are all aiming to achieve great goals of finding better therapies for HD patients and families. I feel honored to be a part of the HSG and consider us all a big family! What’s the most meaningful aspect of working with HD patients? The most meaningful aspect of my job is the relationships I am able to develop with the patients and families. While HD can be challenging, I feel these patients and families really entrust a great deal of their personal lives with us as their providers, and I’m privileged to be involved in their care. I am also able to learn a tremendous amount by listening to both patients and families, and sometimes that is really what they want and need more than anything. As I reflect on my work with HD, one of my favorite quotes by William James comes to mind-“Act as if what you do makes a difference. It does.